Celebrate humanity's diverse expressions of power and divinity with these mystical symbols from around the world. These luxuriously scented Gardenia candles by Nirvana burn for a whopping 120 hours. This one is for the Original Vibration of Creation, and is our invitation into the Divine. 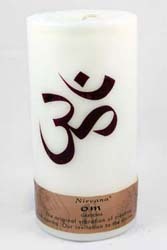 It has an ancient Tibetan "Om" symbol infused into the wax.